Template Text is accessible from the Form Settings. You simply select the language that you wish to have template text appear in and then click “Edit” to the right of the Template Text language field. Template Text allows you to modify text that will appear in the login, execution or as a result of submission of a form entry. Different messages result based on the combination of circumstances surrounding the state of the form and the actions of the user. Messages: refers to general messaging text used when submitting an entry or saving a draft, etc. Errors: refers to text utilized for error messages that must be issued during form update, execution and submission. Name: Represents the language you would like the messages to be communicated in. Logout: Represents the text that would appear as the logout link in the form menu. Return to Menu: Represents the text that appears as the Return to Menu link would appear in the form. Upload Complete: Represents the text that appears when a file was successfully uploaded in the form. Login: Represents the text that appears on the Login button and label of the Login Screen in the form. Signup: Represents the text that appears on the Signup button and label in the Login Screen in the form. Email: Represents the text that appears in front of the Email field in the Login/Signup box in the Login Screen of the form. Password: Represents the text that appears in front of the Password field in the Login/Signup box in the Login Screen of the form. 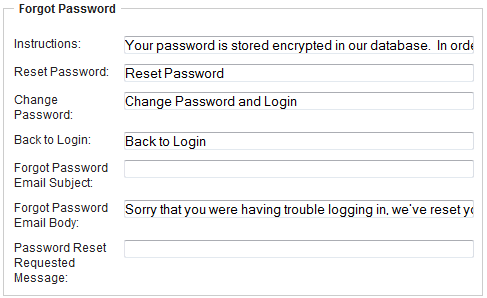 Forgot Password: Represents the text that appears in place of Forgot Password in the Login/Signup box in the Login Screen in the form. 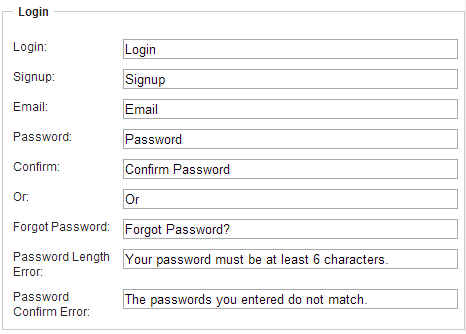 Password Length Error: Represents the error message text that appears when password selected is not at least 6 characters. Password Confirm Error: Represents the error message text that would appear if the applicant does not confirm their password. Create/Edit Application: Represents the text that appears on the menu on the Create or Edit Application button. 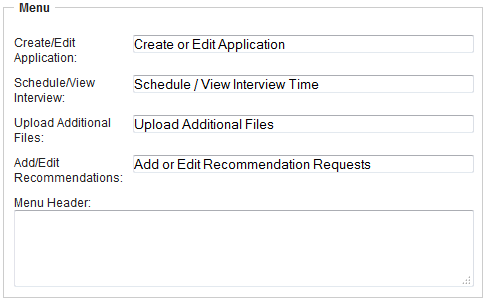 Schedule/View Interview: Represents the text that appears on the Schedule/View Interview button in the form's menu. 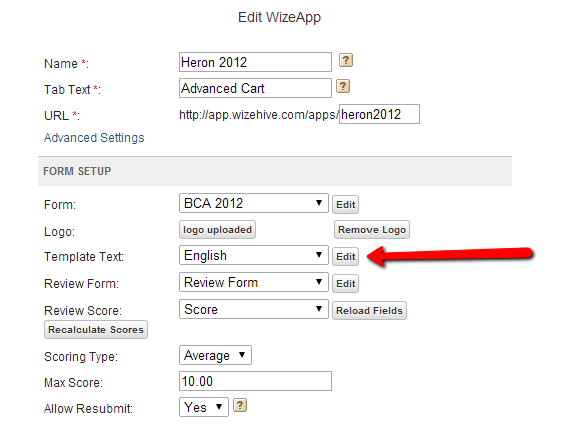 Upload Additional Files: Represents the text that appears on the Upload Additional Files button on the form's menu. Add/Edit Recommendations: Represents the text that appears on the Add or Edit Recommendation Requests button on the form's menu. Menu Header: Represents the text that appears above all the buttons on the form's menu. This text appears below the Application Submitted message. Save Draft: Represents the text that appears on the Save Draft button. Submit: Represents the text that appears on the Submit button. Previous: Represents the text that appears on the form on the Previous paging button. Next: Represents the text that appears on the form on the Next paging button. Max Upload Size: Represents the text that would appear on the form next to any upload field indicating the maximum size the uploaded file can be. Applicant: Represents the text that appears on Recommendation Upload Screen (the screen the recommender uploads their recommendation) before the applicant's name. Attach Recommendation: Represents the text that appears in front of the Attach Recommendation on the Recommendation Upload Screen. Recommendation Uploaded: Represents the text that appears to the recommender when they have successfully uploaded a recommendation. Recommendation Request Saved: Represents the text that would appear to the recommender when they have successfully saved a Recommendation in response to a Recommendation Request. Recommendation Requests Submitted: Represents the text that appears when the applicant has successfully made and sent their Recommendation Requests. Edit Recommendation Request: Represents the text that appears on the Recommendation Request screen to guide the applicant in editing/changing their Recommendation Requests. 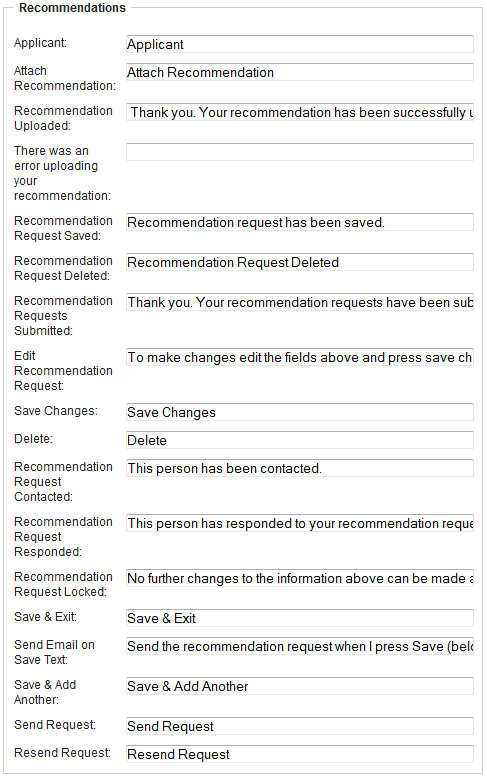 Save Changes: Represents the text that appears on the Save Changes button in the Recommendation Request screen. Delete: Represents the text that appears on the Delete button in the Recommendation Request screen. Recommendation Request Contacted: Represents the text that appears to the applicant to inform them once the recommender has successfully been contacted. Recommendation Request Responded: Represents the text that appears to the applicant to inform them once the recommender has successfully responded. Recommendation Request Locked: Represents the text that would appear to the applicant to inform them once their Recommendation Request has been made, the recommender has been contacted and responded so that no further changes to that Recommendation Request can be made. Save & Exit: Represents the text that appears on the button that Saves recommendation requests and brings the user back to the form's menu. Send Email on Save Text: Represents the text that appears on the Recommendation Request screen to guide the applicant to save their Recommendation Request email text and send the corresponding request email(s). Save & Add Another: Represents the text that appears on the Recommendation Request screen to guide the applicant to save their Recommendation Request and add another Recommendation Request. Checkout: Represents the text that appears on the Checkout Button in an Advanced Cart. Checkout Instructions: Represents the text that appears as Checkout Instructions to guide the applicant through payment on the Checkout page. First Name: Represents the text that appears as the label for the First Name field in the Payment Section. Last Name: Represents the text that appears as the label for the Last Name field in the Payment Section. Address: Represents the text that appears as the label for the Address field in the Payment Section. City: Represents the text that appears as the label for the City field in the Payment Section. State: Represents the text that appears as the label for the State field in the Payment Section. Zip: Represents the text that appears as the label for the Zip field in the Payment Section. Card Number: Represents the text that appears as the label for the Credit Card Number field in the Payment Section. 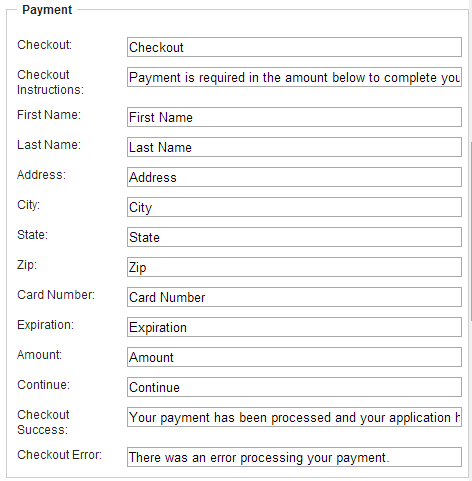 Expiration: Represents the text that appears as the label for the Expiration Date field in the Payment Section. Amount: Represents the text that appears as the label for the Amount field in the Payment Section, representing the amount to be charged. Continue: Represents the text that appears in place of the word Continue in the Payment Section. Checkout Success: Represents the Message that appears for the applicant when they have successfully paid and checked out. Checkout Error: Represents the Message that appears for the applicant when they have not successfully paid and checked out. 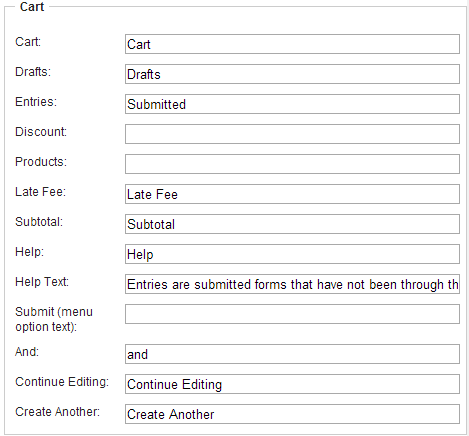 Cart: Represents the text that appears at the top of a form, showing the user what is in their cart. In this section it shows the number of submitted entries and the number of drafts that have not been checked out yet. Drafts: The text that labels the number of drafts. Entries: The text that labels the number of submitted entries that have not been checked out. Create Another: The text that labels the Create Another radio button at the bottom of a form. Password reset Requested Message: The message that appears when you send the password reset message, by default it reads, "Password reset has been requested." Application Submitted: Represents the text that appears to the applicant when an Application has successfully been submitted. Draft Saved: Represents the message that appears to the applicant in place of Draft Saved when an Application Draft has successfully been saved. Confirm Submit: Represents the message that appears to the applicant to ask the applicant to confirm their intent to submit their application, signaling that they are sure that their responses are final. Confirm Logout: Represents the message that appears to the applicant when they have made edits to their application which have not yet been saved and will be lost if they log out but before they log out. Password Reset: Represents the message that appears to the applicant when their password has been reset and they need to choose a new password. Session Expired: Represents the error message that appears when a user’s session has expired. 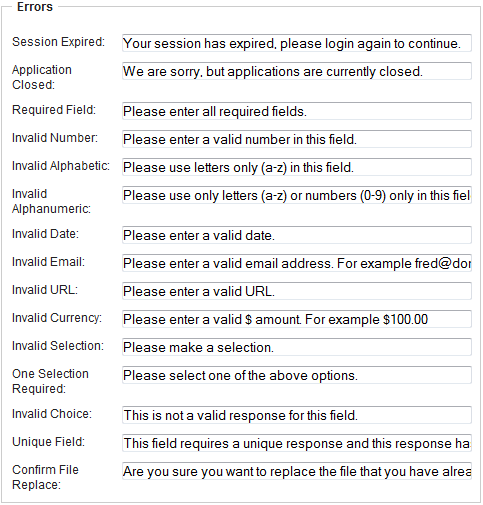 Application Closed: Represents the error message that appears when the form is closed for submission. Required Field: Represents the error message that appears when a required field has not been completed and the user is trying to submit their entry. Invalid Number: Represents the error message that appears when a numeric field has been completed with an invalid number. Invalid Alphabetic: Represents the error message that appears when an alphabetic field has been completed with a non-alphabetic character. Invalid Alphanumeric: Represents the error message that appears when an alphanumeric field has been completed with an entry that is not alphanumeric. Invalid Date: Represents the error message that appears if a date field has been completed with an invalid date entry. Invalid Email: Represents the error message that appears if an email field has been completed with an invalid email address. Invalid URL: Represents the error message that appears if a URL field has been completed with an invalid URL. Invalid Currency: Represents the error message that appears if a currency field has been completed with an invalid currency entry. Invalid Selection: Represents the error message that appears no selection has been made for a required dropdown field. One Selection Required: Represents the error message that appears if at least one selection has not been made for a multi-choice checkbox field. Invalid Choice: Represents the error message that appears if the user makes a selection that is not valid for a defined entry. Unique Field: Represents the error message that appears if a unique response is not provided to a given field that requires unique entries. Confirm File Replace: Represents the error message that appears if a user tries to replace a file that has previously been uploaded with another to confirm that they want to make the replacement.